During a recent study of interstellar clouds made of molecular dust and gases, scientists made a musical discovery that may unlock answers to lingering questions about the formation of stars. Previously, scientists had to rely on 2D projections of molecular clouds because that was all their telescopes could see. Researchers Aris Tritsis and Konstantinos Tassis discovered a cloud named Musca in the Southern Sky that is vibrating. The "singing" cloud is surrounded by hair-like striations that are the result of gas and dust waves being trapped by the vibrations. 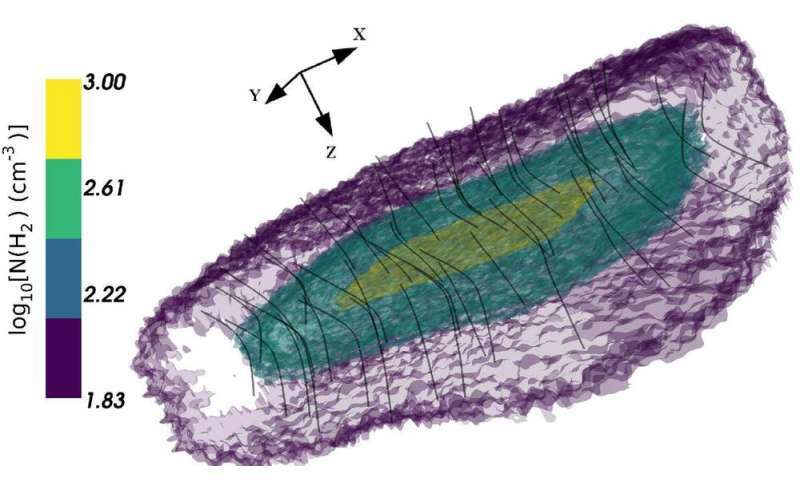 "Trapped waves act like a fingerprint," wrote Tritsis for Phys.org. "They are unique and can be used to identify the sizes of the boundaries that trapped them... Just like a cello and a violin make very distinct sounds, clouds with different sizes and structures will vibrate in very different manners – they will 'sing' different 'songs.'" And that's exactly what they did: taking it one step further, Tritsis and Tassis scaled the frequencies of the Musca cloud to a range that humans can hear and created an actual song from the singing cloud, which they titled "Song of Musca." By using the observations and fingerprint of trapped waves, researchers were able to create the first-ever 3D model of the interstellar cloud. "The 3D structure of interstellar clouds has been, for decades now, the 'holy grail' in figuring out how clouds break up into smaller fragments, and how these fragments go on to form stars," Tassis told Space.com. "Despite the fact that Musca looks like a thin cylinder from Earth," Tritsis writes, "the true size of its hidden dimension is not small at all. In fact, it is comparable to its largest visible dimension on the plane of the sky." "With its structure now determined, Musca can be used as a prototype laboratory against which we can compare our models and study the early stages of star formation," Tritsis continues. "We can use Musca to better constrain our numerical models and learn about our own solar system. It could help solve many mysteries. For example, could the ices found in comets have formed in clouds rather than at a later time during the life of our solar system?" As usual, discoveries lead to more questions – but that's what keeps astronomers looking to the stars.